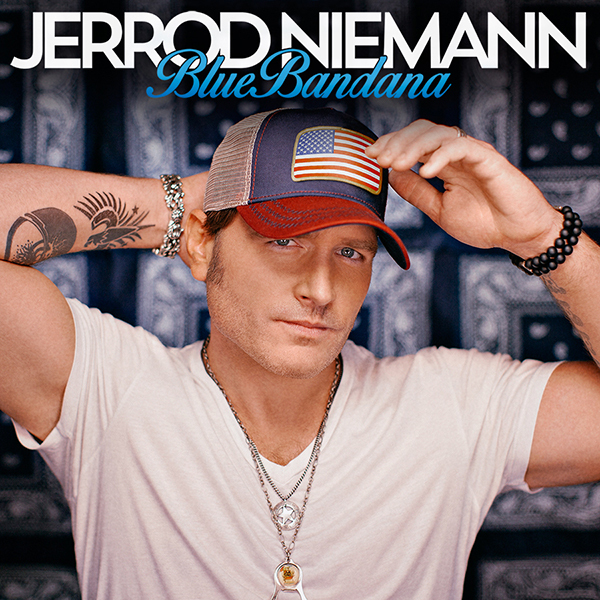 Jerrod Niemann’s latest single “Blue Bandana” hits radio today, a Southern-rock-infused ode to music festivals and the bandana-clad devotees they draw. The song is a bit of a sonic departure for Niemann, whose last three singles, “Drink To That All Night,” “Donkey,” and “Buzz Back Girl” sat on more synthetic tracks, while “Blue Bandana” has a more organic feel. Though the three have known each other for a while, the songwriting session in February of last year that spawned “Blue Bandana” was the first time the three of them had ever written together. Solar began playing the song in his live sets, though on the recorded end it was put on the back burner. At the time of the write, Solar was in talks with Sea Gayle, Solar (and Niemann)’s current publisher, and while the team found the song cool, it was set aside to focus on other songs. The song ended up on hold for Jake Owen, and was unavailable when Niemann first heard it, but the artist clicked with the song immediately, and snapped it up as soon as the hold with Owen was released. The song is not only the first single for the three writers, it’s the first cut they’ve had with a major artist. Made particularly impressive is the fact that the song was written when none of them had a publishing deal. Grab “Blue Bandana” on iTunes.